Librarian Little: The Sky is Not Falling!™: "Livin the DREAM"
"Livin the DREAM" is a pat response sometimes, but my work as a librarian really is my dream job. So, I know what I am passionate about and now I just need to make sure I take care of myself so I can continue to live the dream. "Element" by Ken Robinson is several years old but is great if you're looking to ignite or re-ignite your passion. Arianna Huffington, just wrote a new book about redefining success after physical problems caused her to reassess what is truly important. The Element: How Finding Your Passion Changes Everything by Ken Robinson and Lou Aronica - The Element is the point at which natural talent meets personal passion. When people arrive at the Element, they feel most themselves and most inspired and achieve at their highest levels. With a wry sense of humor, Ken Robinson looks at the conditions that enable us to find ourselves in the Element and those that stifle that possibility. 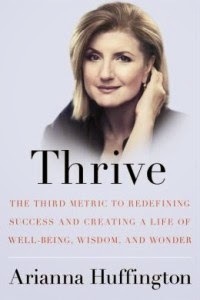 Thrive: The Third Metric to Redefining Success and Creating a Life of Well-Being, Wisdom, and Wonder by Arianna Huffington In Thrive, Arianna Huffington makes an impassioned and compelling case for the need to redefine what it means to be successful in today's world.